For anyone who is learning to cook, hosting a dinner party is a great way to show off your developing skills. Serving cheese fondue ensures a fun evening, full of delicious and comforting flavors. With a few tips, you can create an extra-cheesy meal that will have your guests talking for weeks to come. The most important part of a successful night of fondue is the cheese sauce. There’s plenty of room for customization, but Serious Eats provided a basic recipe that will get you started. First, add flavor to the sauce by cutting a clove of garlic in half and using one piece to rub down the interior of the fondue pot. Pour in a cup of dry white wine and heat until it starts to steam. Combine grated Emmental and Gruyere cheeses with cornstarch in a bowl. Then, begin placing handfuls in the pot, maintaining a low heat until it all melts into a smooth mixture. For more flavor, pour in some lemon juice and the fruit brandy kirsch. Add salt and pepper and serve. Feel free to throw additional cheeses into the mix if you like, such as fontina or English-style cheddar. The Kitchn emphasized that more varieties mean a more intriguing flavor for the sauce. Just be sure to test the combination before serving a crowd. Also, a full-bodied ale can make an excellent substitute for wine. Your guests will need plenty of items with the right texture and taste to go with that delicious cheese sauce. The recipe that chef Ludo Lefebvre provided to Bon Appetit calls for bread, salami, ham and crudites, meaning raw vegetables like celery, carrots and broccoli. To keep things interesting, provide a few different kinds of bread, ranging from a simple baguette to walnut bread. Complete the evening with chocolate fondue. After dinner, keep everyone gathered around the table for a rich course of chocolate fondue. 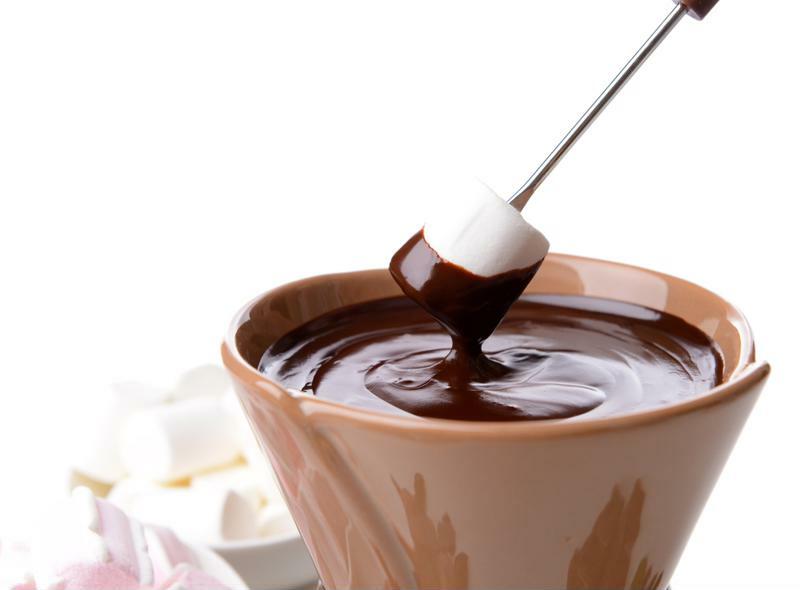 Popsugar advised selecting a high-quality bar and melting it on the stove over a low heat before pouring the chocolate into the fondue pot. Cookies, marshmallows, rice squares and dried fruit are all great choices for dipping. If you opt for fresh fruit, add a brushing of lemon juice to ward off oxidation. Fondue is a simple dish that brings people together for a fun meal. With a couple easy recipes, you can start exploring the many different cheeses and dipping options that will make your night a success.